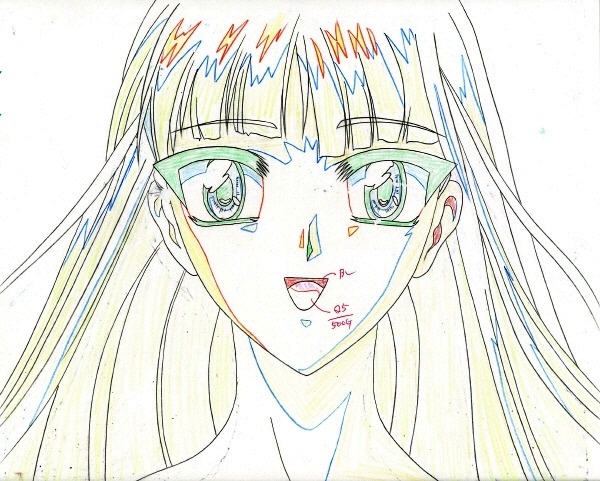 Updated 4/9/2015 This cel comes from the second OVA episode, at the conclusion of the battle between the now-united Umi/Selece and Ascot's mecha. The more-experienced Ascot presses Umi hard (and Tokyo's landmark Rainbow Bridge is collateral damage). But during a pause, the two exchange insults, during which Ascot lets drop the information that Hikaru, whom Umi thought was killed at the end of the first episode, is in fact still alive. Energized, Umi/Selece decks Ascot, then turns to the audience. We first see the impassive (but somehow smug) face of the mecha, then Umi's face from within, likewise stern and battle-wise. 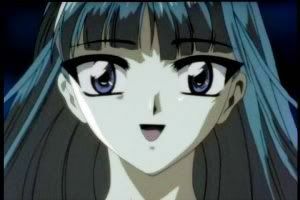 Then, in one of those striking artistic moments that make the OVA worth watching in spite of its narrative incomprehensibility, she suddenly breaks into a brilliant smile, says "Hikaru!" and as quickly reverts to the original stern look. This wonderful cel comes from the middle of this cut. The coloring is especially lovely, with all the shades shifted toward the sea-green of Umi's elemental spirit that has absorbed her. Even the red of her tongue is muted by a touch of green. I've adopted the manga translation's spelling of Umi's mashin/"rune god," but it's worth noting that the correct transliteration is "Ceres." As with many other character names in the MKR saga, this was originally the brand name of a sporty automobile. This special model of the Toyota Corolla was named after the Roman goddess of agriculture. It was also sold as the Toyota Sprinter Marino, another name that suggests the glory of Rome. Arguably "Marino" would have been a better name for the mashin, as it means "of the sea," while Ceres is an Earth goddess, not a Water deity.